They've been delighting residents and visitors to Tamworth for a year - and now the Staffordshire town's herd of replica pigs have been spared from the equivalent of the slaughterhouse. The 15 beautiful boars, which have been variously and colourfully decorated by schools, businesses and community groups, have proved such a popular attraction that it has been decided to leave the porkers in place until they reach the end of their natural life span. The 3 ft by 3 ft wood and metal sculptures, inspired by the famous Tamworth Sandybacks breed of pigs, were trotted out in prime locations across Tamworth in June last year in a major display of public art organised as part of the I Am Tamworth project. It had been intended to remove the pigs, which formed their own 'Trotters Trail, at the end of last summer. 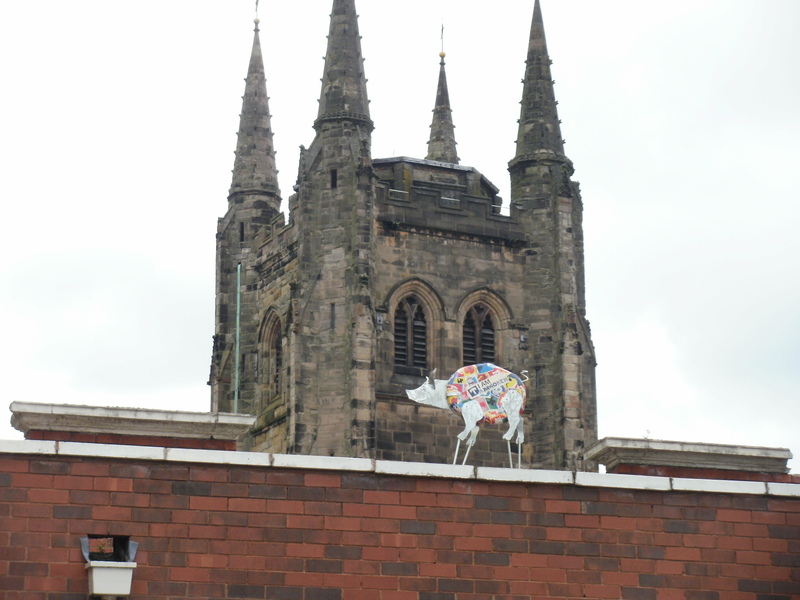 But even though the project finished months ago, Tamworth Borough Council's Arts & Events and Street Scene teams have decided to let the pigs stay in their current homes for the foreseeable future. The pigs were designed by celebrated sculptor and industrial artist, Luke Perry, who then helped various school and community groups decorate the finished works of art with bright colours, designs and illustrations representative of their work or elements of the town's identity and history. Councillor Joy Goodall, Tamworth Borough Council's Cabinet member for Environment & Culture, said: "Trotters Trail was one of many fantastic elements of last year's ambitious I Am Tamworth project. 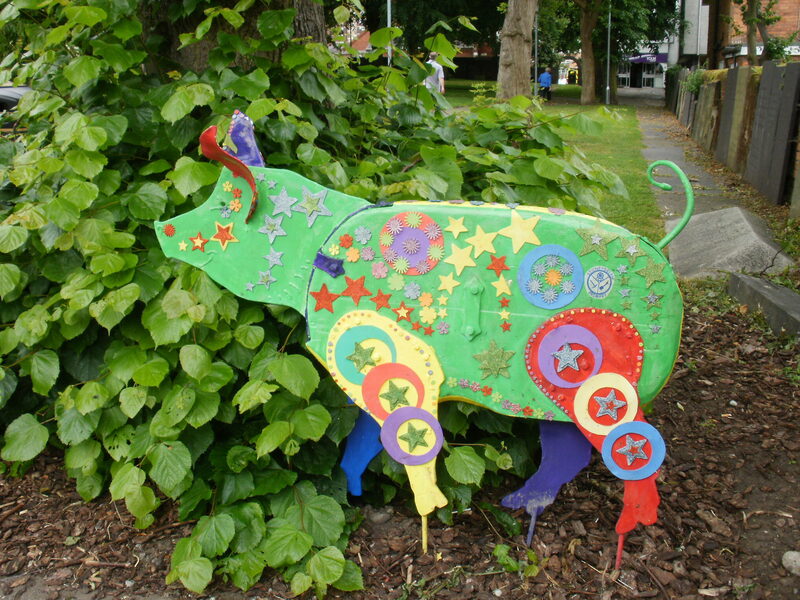 Schools, community groups and businesses put a lot of effort into decorating the pigs and the resulting sculptures have added real colour and interest to the borough. The pigs have become popular features of the community and many people have enjoyed spotting them all. It is great that they will continue to be enjoyed in the coming months and years." 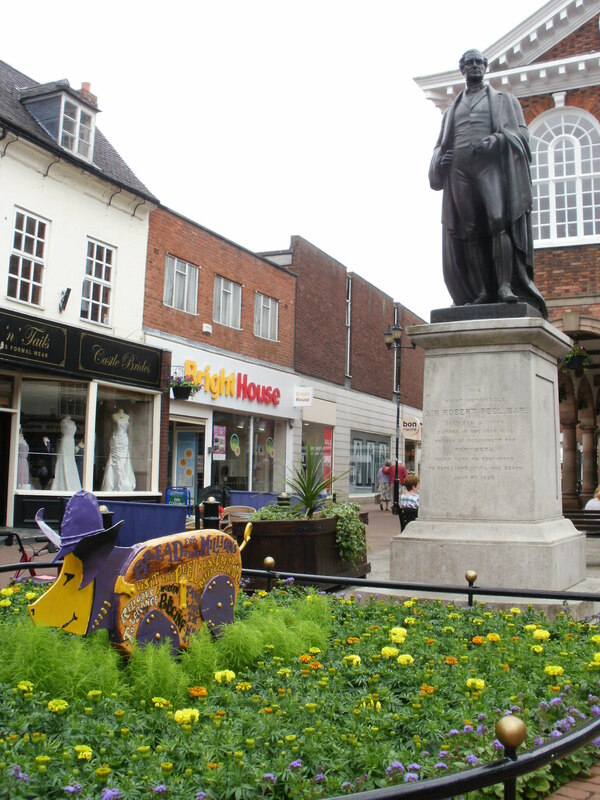 Funded by Arts Council England and organised by Tamworth Borough Council's Arts & Events team, I Am Tamworth was designed to inspire people of all ages to embrace the arts and get creative in a variety of ways. The project attracted audiences of more than 100,000 people and saw more than 7,300 Tamworth residents taking part in creative activities. Here is a list of the pigs and their locations. 1. Bobby the Peeler. Decorated by the Peel Society and demonstrating the achievements of Sir Robert Peel. Can be found next to the Sir Robert Peel statue in Market Street. 2. Hogred The Boar. Tamworth Heritage Society used Tamworth's buildings and heritage as the theme for their pig, situated on the Upper Lawn in the Castle Grounds. 3. Ziggy the Piggy. Located in St Editha's Church and designed by children from St Elizabeth's Primary School. 4. Bloom. Painted by Stoneydelph Primary School children using the flower beds in the Castle Grounds as inspiration. Bloom can be found at the top of Little Church Lane. 5. I Am Tamworth Festival Piglet. The 'Festival piglet' decorated by Tamworth Borough Council's Arts and Events team is covered in logos from the I Am Tamworth project. It can be seen at Tamworth Assembly Rooms. 6. Lily the Pig. Painted by Dosthill Primary School children, inspired by Monet's water lily paintings. Located at Dosthill Primary School. 7. The King of Merskia. This skiing pig was decorated by pupils of Coton Green Primary School who painted it in the colours of the Mercian flag. It is located at the Snowdome Island. 8. Tommy. 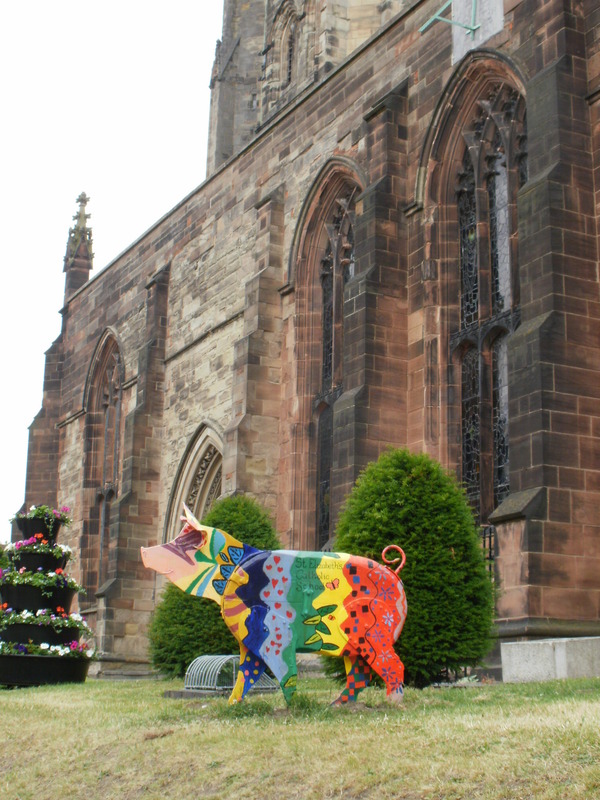 The Thomas Barnes Primary School pig was inspired by the Tamworth landscape and can be spotted in the flower box outside The Fox pub in Lichfield Road. 9. Owl Pig. Decorated by pupils at Birds Bush Primary School in tribute to the school's owl mascot. Situated at the Two Gates Lifeboats Island in Tamworth Road. 10. Community Café Fireman Ham. Decorated by members of the Community Café using its activity sessions at Belgrave Community Fire Station as inspiration. It is located at the fire station in Marlborough Way. 11. YOSHy Piggy. Painted by the Youth of Sacred Heart Church based on the theme of 'choosing the right path'. It can be found outside the Sacred Heart Church off Silver Link Road. 12. Poppy Pig. This trotter has been adorned with a painted thumb print from every student and teacher at Two Rivers Primary School. It is on the island at the junction of Glascote Road and Silver Link Road. 13. Harold the Herald Headline Hog. The headline-hogging hog decorated by the Tamworth Herald features all the top stories. It lives at Cardinal Point in Ventura Park. 14. Pig-ma-lion. 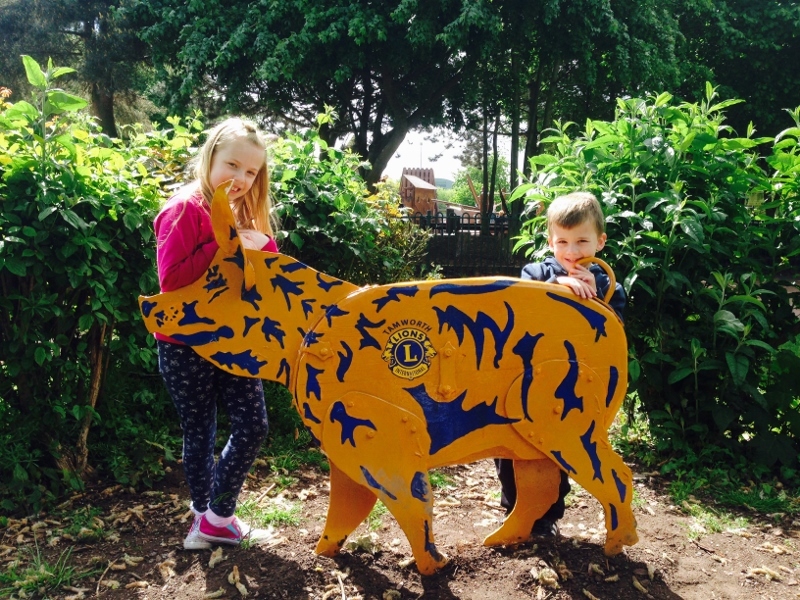 The Tamworth Lions pig has been aptly transformed into a lion and resides at the back of the Pavilion Café in the Castle Grounds. 15. Pork Chop. The Dosthill Brownies and Rainbows incorporated Girl Guide colours into the design of their pig in a celebration of the girl guiding movement. It has been placed on Amington Island at the top of Tamworth Road.